Very thick rug that looks great in my home. A little more burgundy than red. This "Heritage" line of Safavieh rugs is really nice - thick, soft, and good looking. I got 2 "Heriz" rugs and a "Tabriz" runner and they coordinate well. Great quality rug, thick and plush and easy to clean-- great regal rich colors. we were happy with the purchase. Colors are very pretty. It looks and feels like a much more expensive rug. Very pleased with the purchase. The rug is very good quality, but it does not look like the picture at all. The colors are maroon, sage, navy and cream and not at all like the picture. 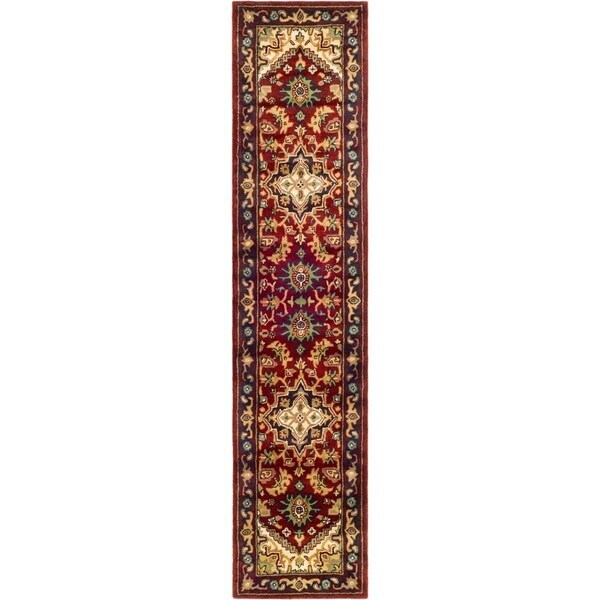 Overstock delivers again by offering great prices, coupons, and quality items such as this Safavieh Handmade Heritage Traditional Heritage Runner. It's beautiful and very well made and I recommend Overstock.com and Safavieh Handmade wool runners to anyone! As usual OS rugs do not disappoint. So pleased with the plush, thick, well made rug. Never ever thought I could order a rug on line and have such good luck. This is my 4th rug and all have been more than perfect. Same good luck with rug pads. Noticed there haven't been reviews in awhile....color is more burgundy than red and the blending of the accenting colors is terrific. I expect to have this rug for years to come. Only surprise is that it did not arrive in the usual short time I have come to expect from Overstock. I ordered 2 different sizes in this same pattern and am still waiting for the second to arrive...it was worth the wait and I look forward to the one coming for our entry. I bought this runner because I needed one so my expectations weren't very high. Let me tell you. This runner is gorgeous. The colors are beautiful, it is well made, and a nice thick plush rug. It looks and feels like a very expensive rug. Like the reviews say, the colors are not accurate they are not as bright but they are beautiful and will go with any decor. I was so pleased with this rug that I just ordered another one from the same manufacturer but different pattern and different size. This runner works well with the matching large rug. I use it at the entrance to my dining room where there is a lot of traffic. It compliments the matching 9X12 rug. I am very pleased with both rugs. This rug was made really well. The colors were quite vibrant and the thickness of the rug was exactly what I was looking for. It feels great to walk on it, especially with bare feet. I will definitely purchase another rug from Safavieh..the quality is there!! While the quality of this rug is good, it is not as described at all. The color I received is stated as red/blue on the rug's label and it is just that. This is not the first time I have received a rug from Overstock that is the wrong color. Beware. This rug is beautiful! Very plush. I was really pleased with the quality. Terrific Value. The colors are vivid and warm. It is generously sized and perfect for the hallway. I love this rug! I bought the 10' one a few months ago and it has been awesome in a high traffic entrance area in my house. I recently bought this 8' one as a runner in front of my sideboard in my dining room and it is just gorgeous. Beautiful depth of color that adds interest and color versatility to the room. Highly recommend! These are wonderful plush rugs. Vibrant colors, liven up a hallway. It is a great quality for the price. I have been thoroughly satisfied. Yes, these rugs shed a bit for the first 3 months for me. I recommend running your Roomba over it or your regular vaccum and then they stop shedding! Value buy for a premium carpet, HAND MADE. Life long value. These are excellent runners. I purchased 3 for our hallway and had them bound together. I definite plus for our home with the vibrant colors. I used this rug as a stair runner. It's a nice heavy carpet in a beautiful, traditional pattern. It was easy to evaluate on the website and the order was delivered quickly. It was nice to be able to order different sizes of the same pattern to accommodate the steps and landings. I will be ordering more from Overstock in the future. This is a beautiful rug, such rich colors! It is a great weight, laid flat immediately. So glad I chose it, gorgeous in my home!!! Very nice rug. Not a Persian rug at all, but good for the price. Nice finishing touch to the hallway. Was pleased with the quality! And it went well with the other Safavieh rugs we had purchased from Overstock. We would definately order this brand of rug again. "what are the actual colors I see it states red but is it a true red or is it more of a maroon or burgundy color?" Deep burgundy, beautiful, thick rug. The only negative comment would be that they shed! Great price, size, and colors!